Take a bow, boys. You earned it. Beautiful. Liberating. Spiritual. Divine. Epic. It all fits in describing the second, and final, Grateful Dead show at Levi’s Stadium Sunday in Santa Clara, Calif. Given the mixed reviews of the 1960s-leaning, jam-heavy Saturday show, the average age of the group’s core four, the idea Trey Anastasio – you know, that guy from Phish – was “filling in” for Jerry Garcia on lead guitar and the fact the seven main players hadn’t played on such a large stage in decades, there was no reason to expect greatness. 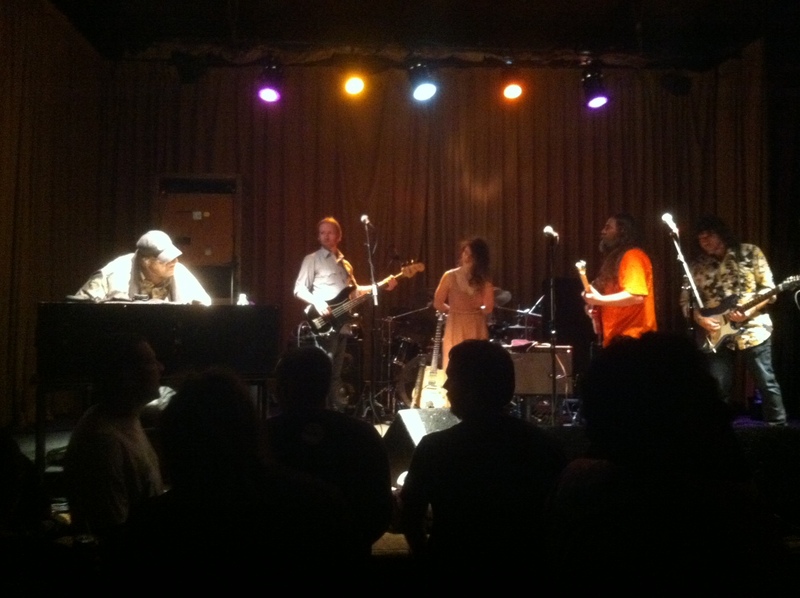 Despite its warts, 6/28/15 was three-plus hours of cathartic bliss – and two sets with a heavy Jerry Garcia influence – for Deadheads. Setlist – Set I: Feel Like a Stranger, New Minglewood Blues, Brown-Eyed Women, Loose Lucy, Loser, Row Jimmy, Alabama Getaway, Black Peter, Hell in Bucket; Set II: Mississippi Half-Step Uptown Toodeloo, Wharf Rat, Eyes of the World, He’s Gone, Drum, Space, I Need a Miracle, Death Don’t Have No Mercy, Sugar Magnolia; Encore: Brokedown Palace. While no Dead show is perfect, this setlist helped offer moments of pure inspiration, and it showed that, in its 50th year, the Grateful Dead are capable of achieving great heights, even during some slightly sloppy moments. Ace was strong Sunday in Santa Clara, Calif.
Phil Lesh played a thunderous bass, working a wonderful back beat with the Rhythm Devils – the ever-steady Bill Kreutzmann and Mickey Hart. On lead vocals, Lesh wasn’t strong during “Eyes of the World” but I didn’t mind it as much as many other Deadhead friends did. 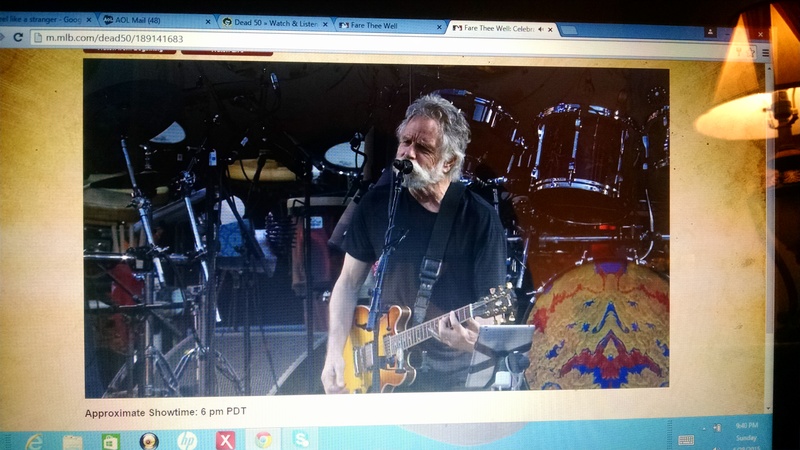 The moments when Lesh spoke to the 70,000 in attendance and countless others watching from home about the liver transplant he needed to stay alive. Again, just another moment to bond the Dead and those die-hard fans. 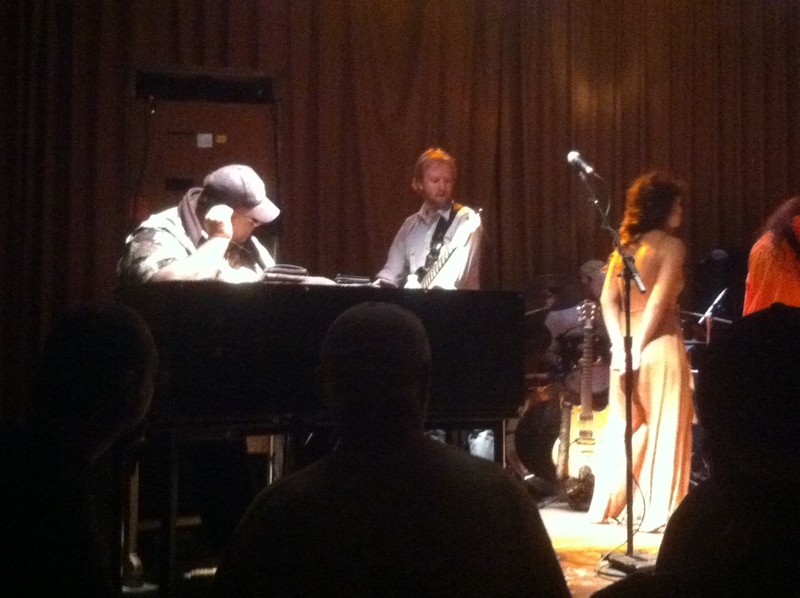 Bruce Hornsby and the piano and Jeff Chimenti on the keyboards, those two couldn’t get enough of each other. Their dynamic interplay showcased the joys the band experiences during a good show, which, make no mistake, this was. And Trey. Well, he entered guitar royalty Sunday night. For those Deadhands who never got into Phish (my hand is raised), Anastasio’s inclusion was reason for slight concern. Would he Phish-up beloved Dead classics? Would he simply mimic Garcia? Would he lead on all Garcia songs? Thankfully, the answers are no, no and no. The Grateful Dead conclude their all-too-brief Fare Thee Well tour with three shows in Chicago, starting tonight. That’s three more opportunities for magic moments. Whether you’re in attendance like several of my friends or couch touring like myself, expect a miracle or two. 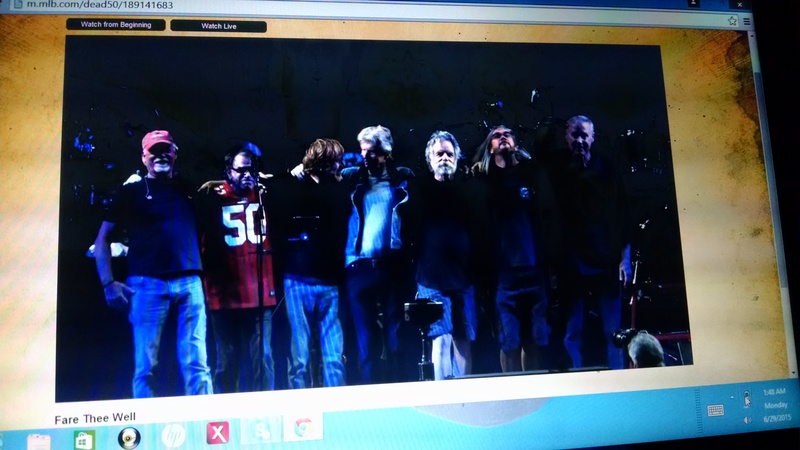 This entry was posted in Concerts, Music, Uncategorized and tagged Bill Kreutzmann, Bob Weir, Bruce Hornsby, Chicago, Deadheads, Fare Thee Well, Grateful Dead, Grateful Dead 50, Jerry Garcia, Mickey Hart, Phil Lesh, Phish, Trey Anastasio on July 3, 2015 by mikekovak. In the newspaper business, reporters form an unusual bond. We’re driven, perfectionists and, in most cases, weird and quirky. That bond is even stronger for those of us who make a living working at night in the hectic, deadline-driven world. And when Tim Menees arrived at the Observer-Reporter as a night cops reporter a little more than a decade ago, I immediately knew he’d fit right in. He was quick with a smile, easy-going and we became immediate friends. Tim, whose father Tim Menees was a well-known political cartoonist for decades at the Post-Gazette in Pittsburgh, cut his teeth in sports. Before the O-R, he worked for the Pirates, and he followed sports closely. At the time, I was a sports writer, but Tim and I shared more in common than a knowledge of Jason Kendall’s batting average or Jack Wilson’s range. We were the same age. We both lived in the South Hills, and neither of us turned down a good time. It wasn’t long before TM, as we often called him at the O-R, and I worked Carson Street together or the bars along Route 19, whether it was in Washington County following a shift or some haunts in the South Hills. We even formed a bit of a routine. TM was the starter, the fearless guy capable of starting a conversation with anyone. I was the closer, the one who came in and added energy and humor to keep things moving. For a couple guys trying to make a living working nights and weekends at a newspaper, it was a pretty good tandem. TM and I hit concerts together. He crashed on my couch multiple occasions. I placed bets for him. He helped me move from South Park to Bethel Park on a muggy, Western Pennsylvania summer day with no convincing needed. He came to house parties after I began co-habiting with Erin, who later became my wife. He was at my bachelor party and our wedding. Most importantly, TM was a good friend, a person I could sit at my dining room table with until 3:30 a.m. talking about anything and everything. I’ve met precious few people in my 40 years I was as comfortable talking to as TM. And after that wedding reception wound down, TM was right there at the hotel, hanging out and providing those of us there who knew him with another classic Menees story – a story I still share now that I’m back at the O-R. Sadly, it was the next to last time I saw Tim, who, according to information on Facebook and provided by co-workers, was found dead Monday by his girlfriend. I got the news about an hour ago, right after I got back inside my house from walking the dog. Even if I hadn’t seen Tim in some time after job changes, moves and life created distance, it hit me like a sledgehammer. TM had fallen and hit his head on ice. A supposed minor injury somehow turned fatal. It’s the first TM story I’ve heard that doesn’t put a smile on my face. Good guys, and believe me when I say he was the dictionary definition of good guy, aren’t supposed to leave us early. This entry was posted in Concerts, Drinking, Friends, Life and tagged Carson Street, Observer-Reporter, Post-Gazette, South Hills, Tim Menees on January 20, 2015 by mikekovak. Anna and I looked forward to Dec. 10 for weeks. 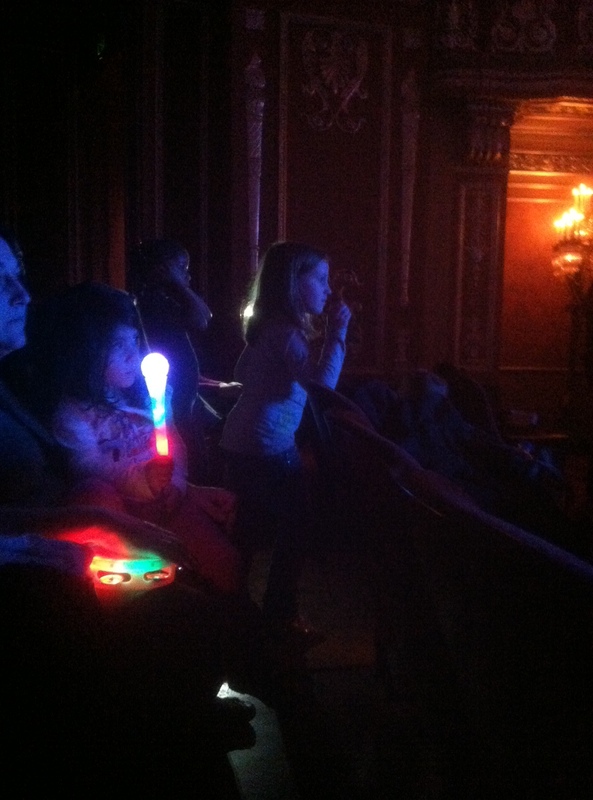 That night, we headed to the Benedum Center in the Cultural District of Pittsburgh for one of the premier events on the kids’ calendar – a Fresh Beat Band concert. For those not in the know, the Fresh Beat Band are one of those made-for-television kids groups. It consists of four members – Twist (rapper/DJ), Shout (vocals/keyboards), Kiki (vocals/guitar/violin) and Marina (vocals/drums) – and airs regularly on Nick Jr. The tour, hailed as Fresh Beat Band Greatest Hits Live, might be a farewell of sorts. While a Fresh Beat Band-based cartoon is in the works, original episodes of the show stopped production in 2013. Who knows if the group plans to tour again. Here’s hoping they do. It’s positive. It’s fun. And, most importantly, it helps draw children to music. That’s extremely important in my world. Tickets for daughter and dad were purchased after Anna went an entire week earning green flags for behavior in her kindergarten class, which is no easy feat given her propensities for talking and talking with volume. Plans, which included her first trip to University of Pittsburgh landmark The O, were made. It marked our second kids concert at the Benedum, where we’d once seen the Imagination Movers. It also marked our second Fresh Beat Band concert of 2014. We’d caught their act at IUP back in January. So, after The O, we made our way downtown, parked in a garage and hustled across the street to the show., A light-up tambourine was purchased. So was a bag of cinnamon-coated walnuts. Added a bottle of water, and we were ready to rock. Anna’s favorite Fresh Beat Band member is Kiki. Mine is the Real MC, Twist. Now, unlike some dads, I have zero problem attending these shows. I’ll get up and dance, sing along and act a fool – all in the name of fun and celebrating music that makes Anna happy. 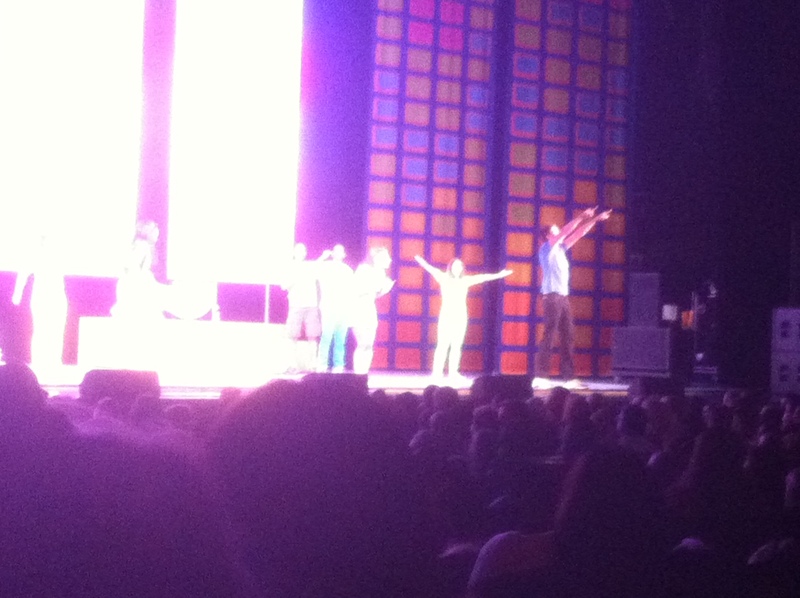 And we definitely had fun watching the Fresh Beat Band. For me, the event also held some nostalgia. Anna is nearing the age of 6, and her tastes are rapidly changing. On the rare occasion she sits and watches television, she prefers tweener shows like “Dog With a Blog” and “Austin and Ally” to cartoons like “Word World” and “Mickey Mouse Clubhouse” her and I watched during daylight hours before I’d head to work. Anna’s days of kids concerts are nearing an end. She’s asking to see acts like Katy Perry and KISS. My little best buddy is evolving. It is what it is. I’ll always hold these early years close to my heart. On Sunday, Anna drew a fever and she’s home from school today. I’m off work after a six-day stretch, that included a fatal apartment fire Friday night less than two hours from deadline. It’s like old times, except my bouncy, bubbly buddy isn’t chattering nonstop. We’re even watching some of our old favorites like “Olivia” and “Wonder Pets.” It’s like a portal to the not-so-distant past, when we jammed out to groups like the Fresh Beat Band. In some weird ways, it’s been wonderful. Just hope she’s back to full health in time for Christmas Eve, and, when she is, I’ll be right here, watching tweener shows, reading an endless string of books together and going to see Katy Perry. 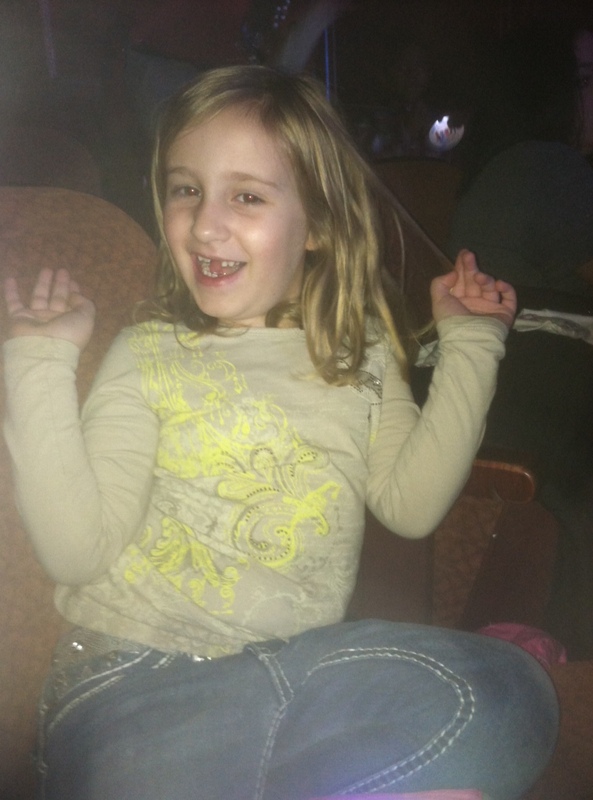 This entry was posted in Anna, Concerts, Fatherhood, Music, Parenting and tagged Benedum Center, Cultural District, Fresh Beat Band, Imagination Movers, Mickey Mouse Clubhouse, Nick Jr., Olivia, Pittsburgh, The O, Wonder Pets on December 22, 2014 by mikekovak. Ace Frehley’s reputation as a rock and roll wildman is well-deserved. The former lead guitarist of KISS is as heralded for his exploits away from the stage as the RnR Hall of Fame-caliber licks he delivers on it. But that reputation is in need of a makeover. There’s still something magical about an Ace Frehley guitar solo. It’s been years since Frehley lost his sobriety, and, as he and his backing band hit Greensburg’s Palce Theater Saturday night for the third gig on his Space Invader tour, which backs an album of the same name, it’s apparent Frehley takes his business seriously. Granted, he didn’t hit the stage until about 10 p.m., but it didn’t take long for the original Spaceman to captivate the crowd his high-decibel rock. 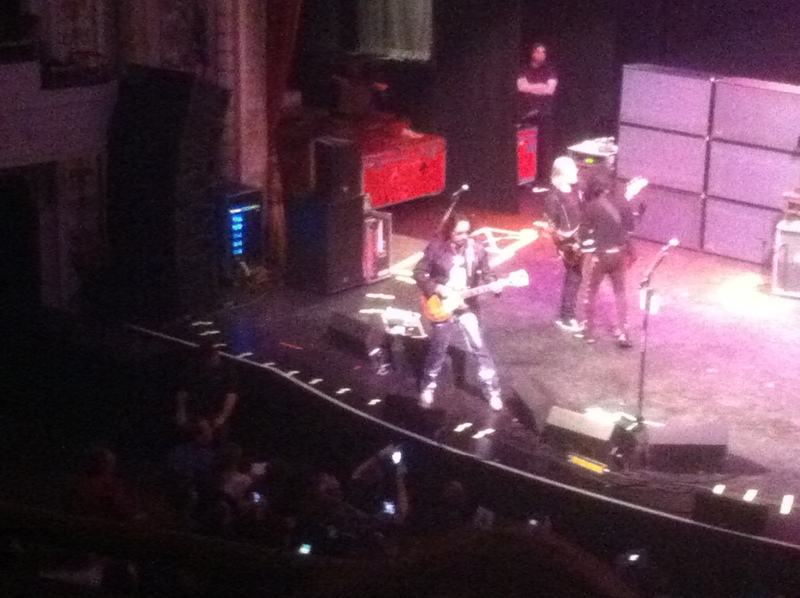 Frehley’s set list at the Palace Theater (11/15/14): Lost in Limbo, Gimme a Feelin’, Toys, Parasite, Snowblind, Love Gun, Breakout, Space Invader, King of the Night Time World, Strutter, Bass solo, Strange Ways, Rock Soldiers, New York Groove, Shock Me, Guitar solo, Rocket Ride, 2 Young 2 Die, Shot Full of Rock. Encore: Detroit Rock City, Cold Gin, Deuce. One thing is certain at a Frehley concert – volume. Chances are your ears will still be ringing the next morning. But the blasts of volume aren’t disguising anything with Ace’s outfit, which includes drummer Scot Coogan, bassist Chris Wyse and guitarist Richie Scarlett. It’s an outstanding group, particularly the talented Coogan, who handled vocals on multiple KISS songs. And Frehley doesn’t shy away from his past. The setlist is loaded with KISS classics, some of which Frehley had a hand in writing. Love Gun, with Coogan’s searing Stanleyesque vocals, was a highlight. King of the Night Time World, an underplayed KISS classic, was a pleasant surprise. Strutter rocked hard. And the encore, a triple-shot of KISS classics, including Cold Gin, the first song Frehley wrote for the band, left the crowd satisfied. Frehley ran through songs from his solo work and Frehley’s Comet. The epic Rock Soldiers stood tall. His playing his sharp. No doubt years of sobriety are treating him well. His confidence is evident, and his new material stands up well with the songs that keep people turning out to see the 63-year-old, who entered the Rock and Roll Hall of Fame earlier this year along with the other original members of KISS. During the induction ceremony, Frehley drew the loudest cheers from the audience. His popularity has rarely waned whether he’s playing in KISS or not. No doubt, Frehley has another tour or two left in him. Chances are his rock soldiers will demand it. 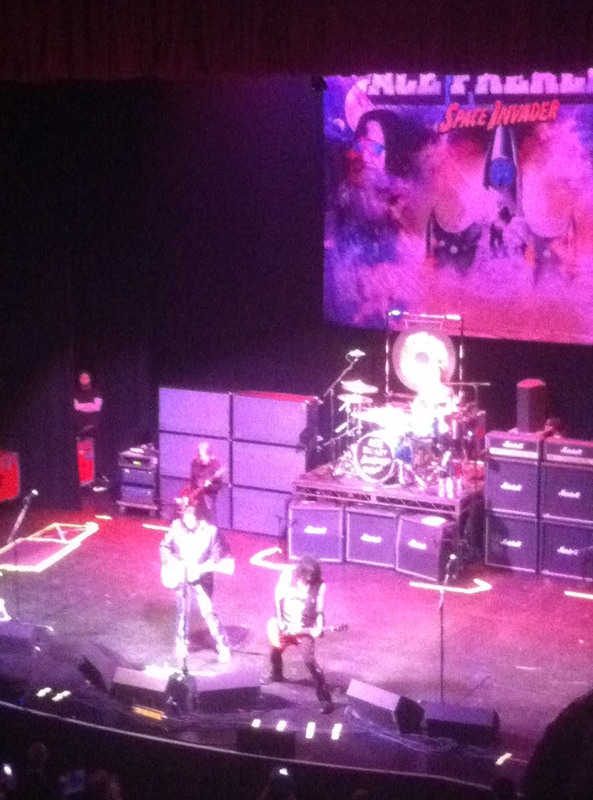 This entry was posted in Concerts, Music, Reviews and tagged Ace Frehley, Concerts, Greensburg, KISS, Palace Theater, Space Invader on November 20, 2014 by mikekovak. My daughter, Anna, isn’t particularly shy, especially around adults. One of the more grand displays of her outgoing nature happened late July 2012 at the annual Coleman Station Bluegrass Festival. If you’re unfamiliar with the festival, that’s OK, just know it’s easily one of the better bluegrass events thrown in Western Pennsylvania. It happens every July in rural Somerset County, and it’s thrown and organized by my brother-in-laws father, Tim Custer, who is an extraordinary banjo player. The festival attracts nationally recognized bluegrass acts in addition to local musicians. It’s an excellent time for family and bluegrass fans. Two years ago, we were lucky enough to attend, and it coincided with my mother’s birthday. Tim, with the help of my brother-in-law, Tim, and nieces, Teresa and Abby, planned to sing her Happy Birthday. Anna was coaxed into going on stage with her cousins, and it didn’t take long for her to command the attention of the few hundred people in attendance. This entry was posted in Anna, Concerts, Music, Video and tagged Bluegrass, Coleman Station Bluegrass Festival, Throwback Thursday on November 6, 2014 by mikekovak. That haunting line, delivered with perfection by Fleetwood Mac’s Stevie Nicks, hit me like a punch to the gut during a recent drive on Interstate 70. Crazy thing is it wasn’t the original version of “Landslide” blaring through the car speakers (Life advice: Always listen to music loud. Don’t be selfish. Share it.). It was a near spot-on cover by Smashing Pumpkin being played on Sirius XM’s Lithium channel. The soaring vocal worked wonders with Billy Corgan’s unique voice. It’s one of those moments when music hits so hard, the world grows silent. No phone checking. No outside noise. Nothing but you and the song. A feeling that washes over and doesn’t let go right away. Pure freedom. And it opened my eyes to something I’ve ignored for years. Namely Stevie Nicks and Fleetwood Mac. Never considered myself much of a Mac fan. Sure, if “The Chain” or “Tusk” came across the airwaves, the channel wouldn’t change, but seeking out Fleetwood Mac’s music wasn’t a priority. That all changed, thanks to Billy Corgan. The day after hearing Pumpkin’s “Landslide,” I logged onto the Google machine and delved into Fleetwood Mac’s original. Nicks transfixed me with her impeccable vocal, and Lindsay Buckingham, a seriously underrated guitarist, delivered the perfect backdrop to one of the best songs I’ve heard in recent years. Yes, “Landslide” debuted in 1975 and I’ve heard it several times before hearing the Pumpkins cover it. But I finally discovered the song, and it led me into acquainting myself with the music of Fleetwood Mac and Stevie Nicks. An open ear can connect you with new music, even if the music is 40 years old. It happened to me on multiple occasions, most notably in the summer of 2006. Tom Petty and the Heartbreakers were celebrating its 30th anniversary by touring with the recently retired Allman Brothers Band. Now, I love the Allmans. Seen them multiple times, and catching them open for Petty sounded like a great way to spend a summer night. So, a former co-worker from the Observer-Reporter and I hit Star Lake Amphitheater. I was geeked to see the Allmans. Petty was an afterthought. An afterthought until Petty and the Heartbreakers took the stage. The sold-out crowd exuded an intense energy, intent on delivering every line in time with Petty. The band cranked out every hit imaginable. The sound was epic. Petty was grateful. A connection was made. Four songs into Petty’s set, I forgot the Allmans opened. And, just like that, Tom Petty became a legend, a guy I put on my Mount Rushmore of music with Jerry Garcia, Bob Marley and Bob Weir. Petty’s music still hits me hard every time I hear it. I haven’t missed one of his Pittsburgh shows since. Hopefully, Fleetwood Mac’s music can come close to doing the same. This entry was posted in Concerts, Music, Video and tagged Allman Brothers Band, Billy Corgan, Fleetwood Mac, Landslide, Sirius XM, Smashing Pumpkins, Stevie Nicks, Tom Petty, Tom Petty and the Heartbreakers on November 4, 2014 by mikekovak. Melvin Seals, left, and Bradley Rhea of Terrapin Flyer get ready for Monday’s gig in Cleveland. That was the question posed by a young tech in the downstairs green room at Beachland Ballroom Monday night. Oddly enough, the tech directed the question to me, as I sat on a couch talking to good friend and bassist extraordinaire Bradley Rhea and his uncle, Frank Rhea, before Terrapin Flyer took the stage for the final gig of a seven-day fall tour. I immediately looked at Brad, eyes wide open in surprise. Brad tried to hold in his laughter, but the odd hilarity of the moment couldn’t contain it. See, I’m 5-foot-8 on a good day, 5-7 most days. Not to brag, but I’m in good shape for a 40-year-old. I’m mostly known as a sports writer, which I no longer am, in parts of Western Pennsylvania. I’m also white. Melvin Seals is recognized by some as the best Hammond B-3 organ player on the planet, and he couldn’t differ more in terms of physical appearance. He’s tall. He’s large. The rest of Terrapin Flyer feeds off another signature jam by Hammond B-3 organist Melvin Seals. 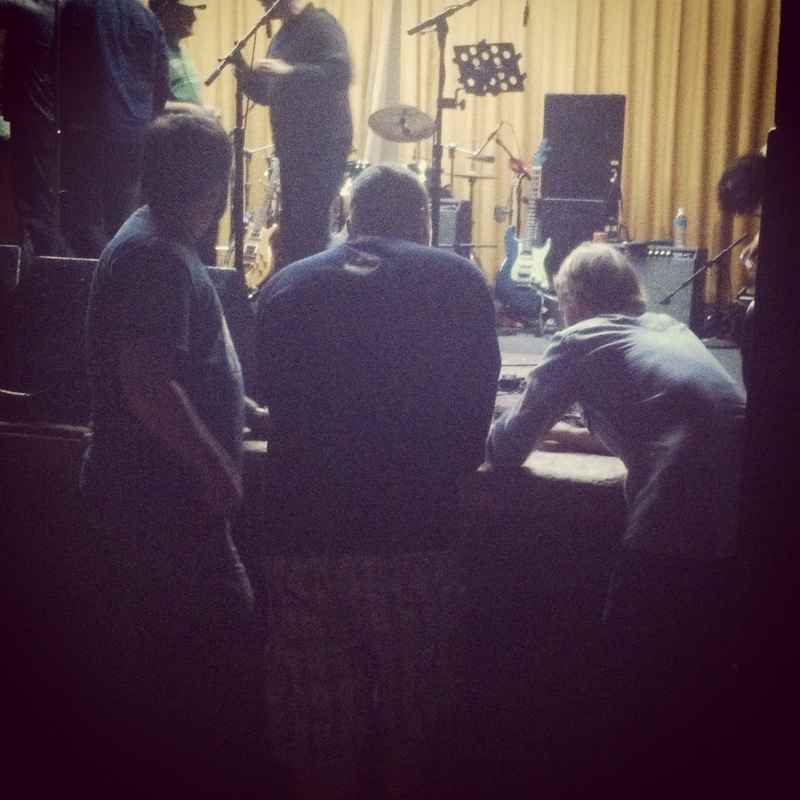 Bradley Rhea, right, signs autographs after Monday’s gig. In the techie’s defense, he obviously doesn’t follow the Dead, and, I was the new guy in the green room at the time, though Seals was sitting on the other side of a coffee table, fresh off telling me about his fear of hitting deer when he drives in certain areas of the country at night. Seals didn’t look up when the tech asked me if I was him, he continued to sign his name to Terrapin Flyer prints, which would be sold at the merchandise table outside the ballroom at Beachland, located in Cleveland’s Collinwood neighborhood. The techie answered affirmatively, and, a few minutes later, Terrapin Flyer was on its way upstairs to perform for the seventh time in seven days in a seventh different city, earning fans at every venue. 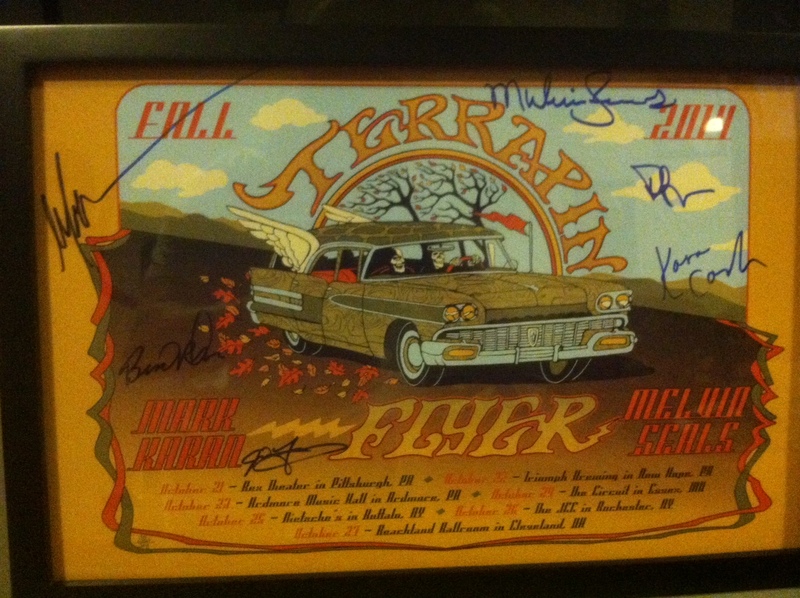 A print autographed by members of Terrapin Flyer. This entry was posted in Concerts, Music and tagged Beachland Ballroom, Bradley Rhea, Cleveland, Grateful Dead, Melvin Seals, Terrapin Flyer on October 29, 2014 by mikekovak.